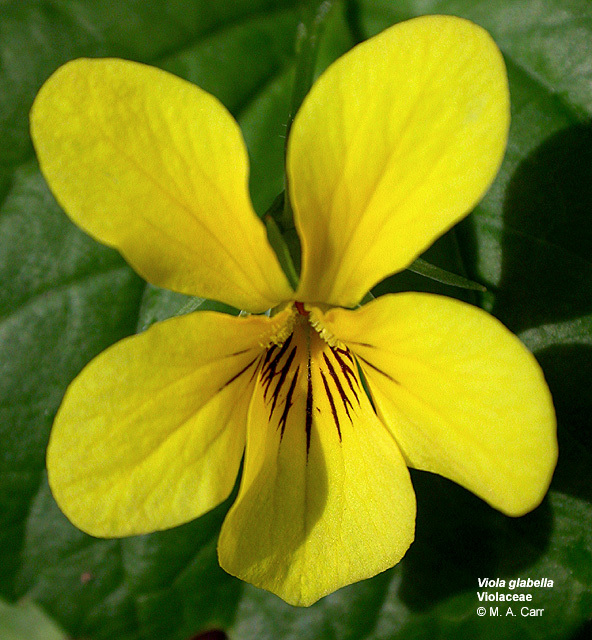 The Violaceae are shrubs or herbs comprising about 16 genera and 800 species. 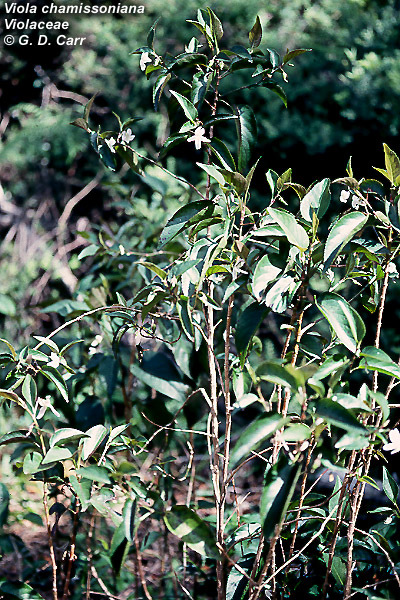 The leaves are alternate or rarely opposite, and are simple; the stipules are minute or leafy. 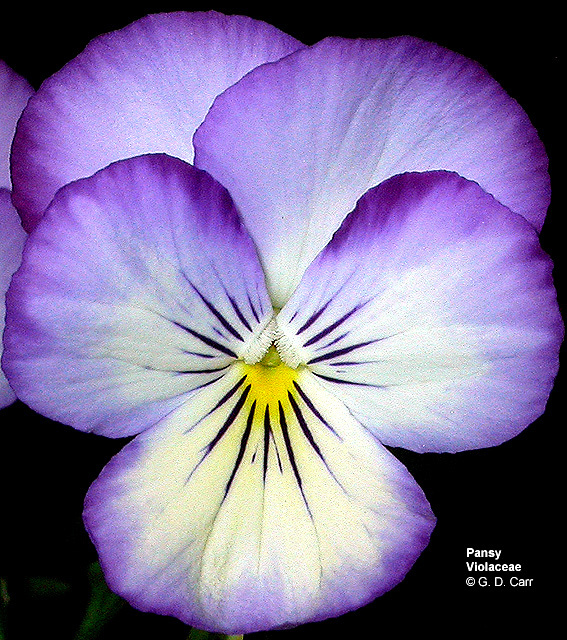 The flowers are bisexual, zygomorphic or sometimes actinomorphic, and sometimes cleistogamous. 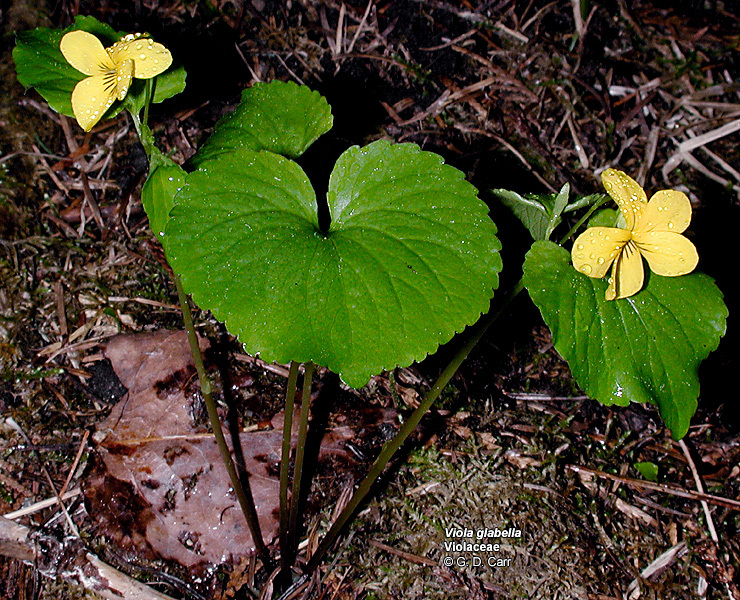 The perianth is differentiated into 5 distinct or nearly distinct imbricate sepals and 5 imbricate petals, the lowermost of which is commonly spurred. 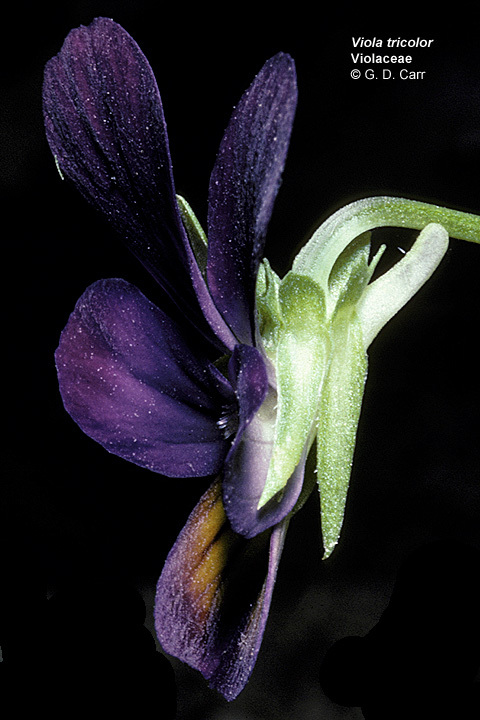 The androecium consists of 5, nearly sessile, distinct or connate stamens with anthers that are weakly coherent around the gynoecium. The two lowermost anthers commonly have nectariferous appendages that project backward into the spur of the lowermost petal. The gynoecium consists of a single compound pistil of 3-5 carpels, a single style, and a superior ovary with one locule containing 1-numerous ovules on each of 3-5 parietal placentae. 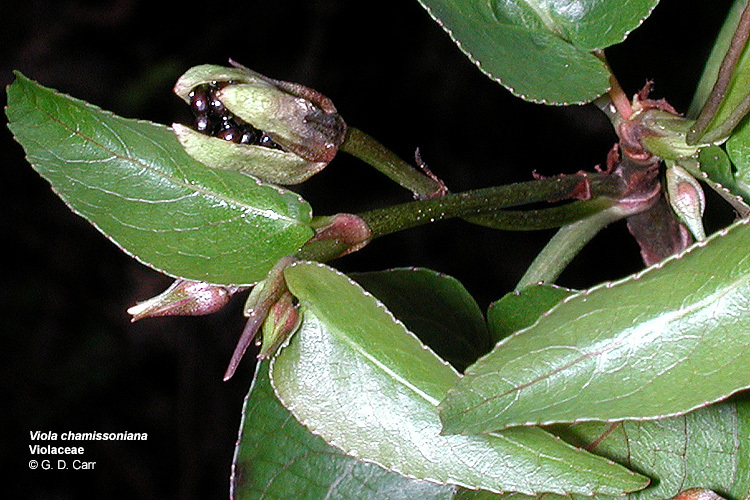 The fruit is a capsule or berry. 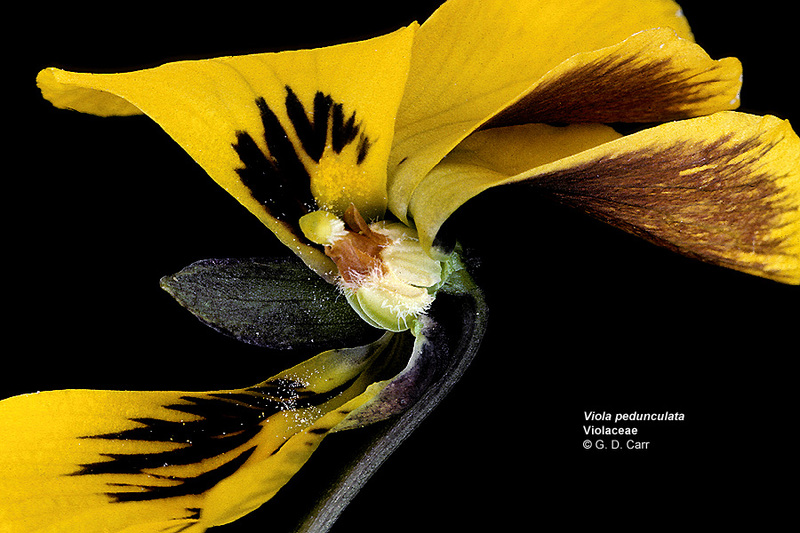 Viola glabella, wood violet, 1- Mt. Spokane, WA, 2002, 2 - Alsea Falls, OR, 2002. 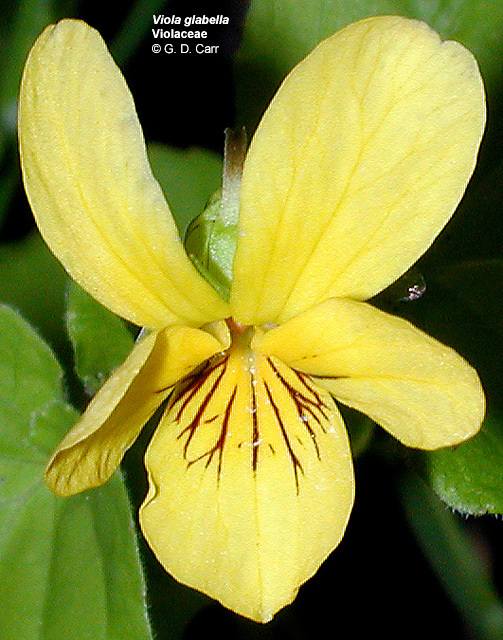 Viola pedunculata, yellow violet. This view of a partly dissected flower illustrates the sessile nature of the stamens and their weak coherence around the pistil. An amber-colored flap of connective tissue extends from the tip of each anther as is common in the family. 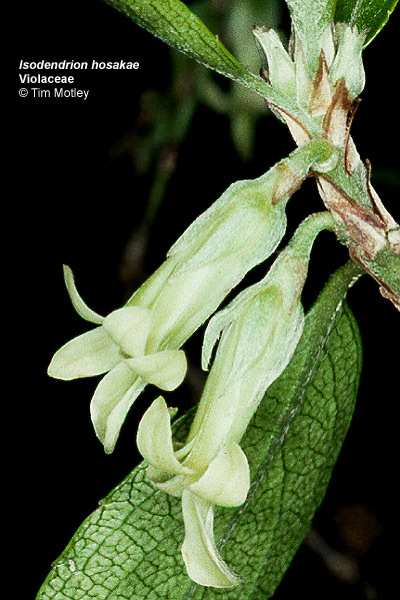 In this species the nectar spur is reduced to a small pouch and the appendages on the lower anthers are also reduced, visible here only as two greenish ridges on the lower anthers. 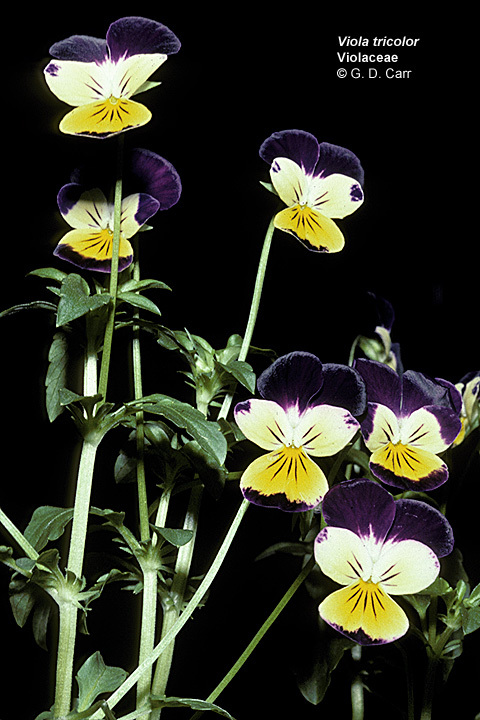 Viola tricolor, pansy. These zygomorphic flowers are typical for the family. Nectar guides or "pencil lines" on the petals guide pollinators to the source of nectar and to a position that will best effectuate pollination. Leafy stipules may be visible in the left photo. 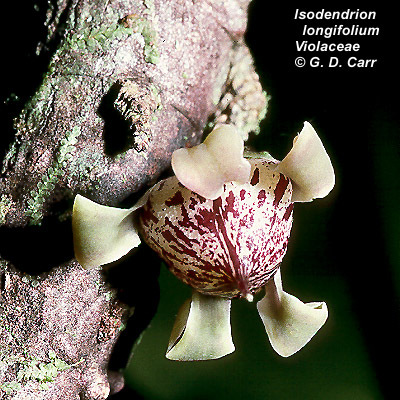 A side view of the flower reveals the spur produced by the rearward projection of the lower petal. Appendages of the lower 2 anthers extend into this spur and secrete nectar. 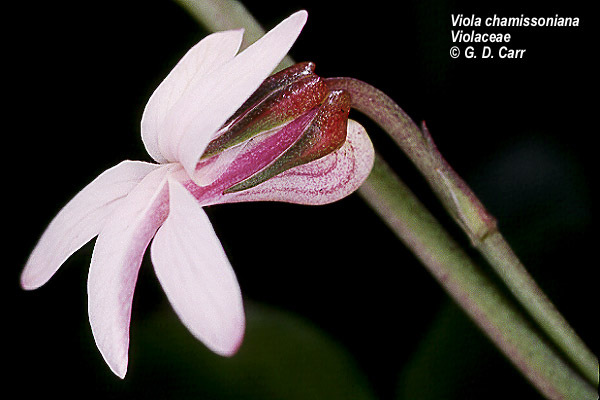 Viola chamissoniana, cf. var. 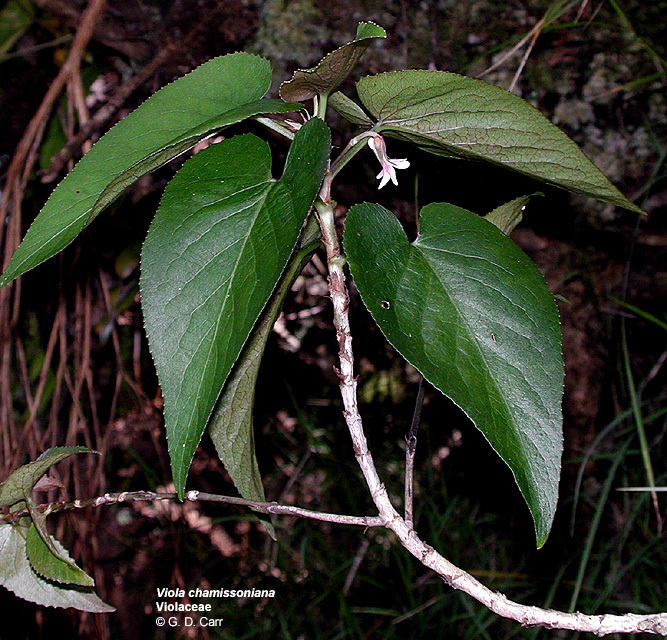 tracheliifolia, pamakani, violet. 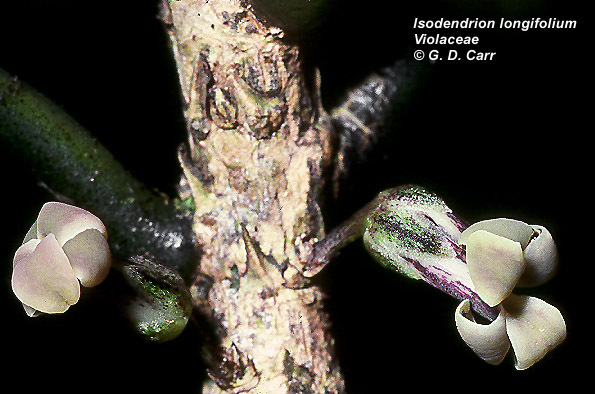 This Hawaiian endemic violet has woody stems that are unusual for the genus. 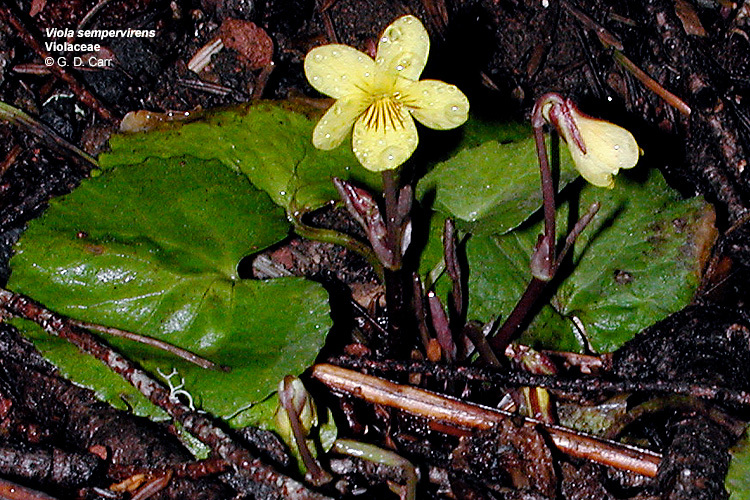 Viola chamissoniana cf. var. robusta, pamakani, violet. 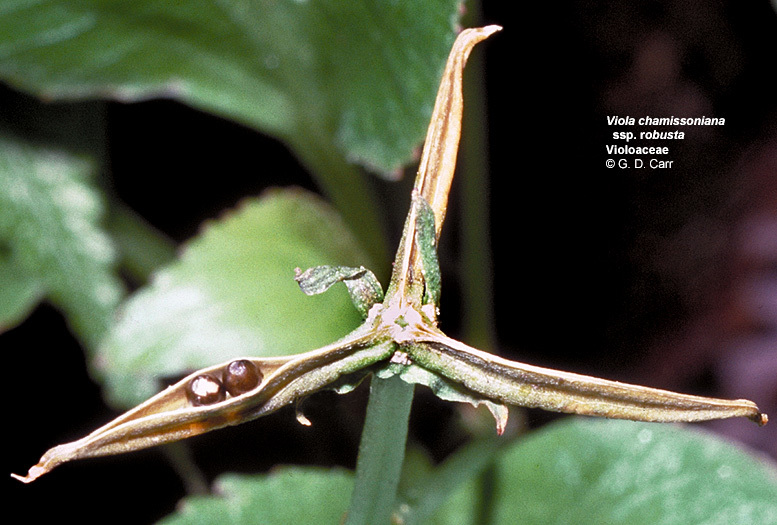 Note the capsule of 3 carpels that dehisces explosively to eject the seeds (two seeds are still visible). 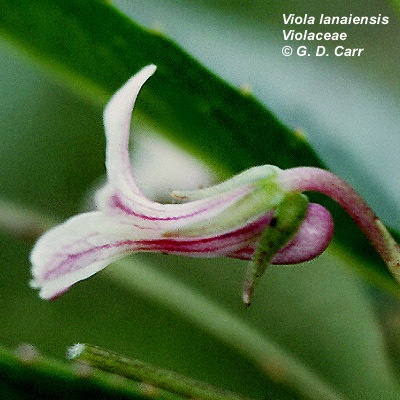 Viola lanaiensis, violet. Hawaiian endemic. 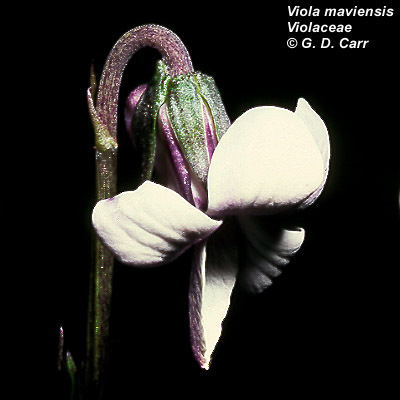 Viola maviensis, violet. Hawaiian endemic. 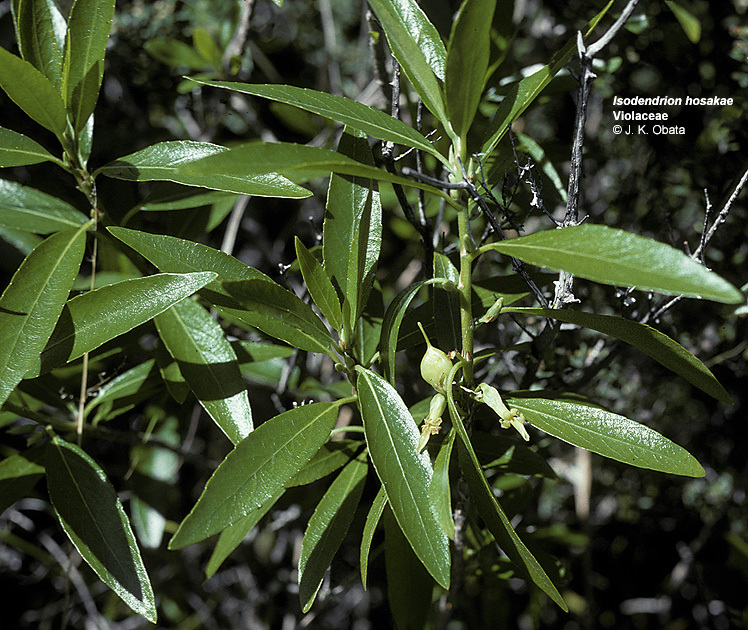 Isodendrion hosakae, aupaka, 1,2 - Pu'u hapapa, Hawai'i, endemic Hawaiian genus. 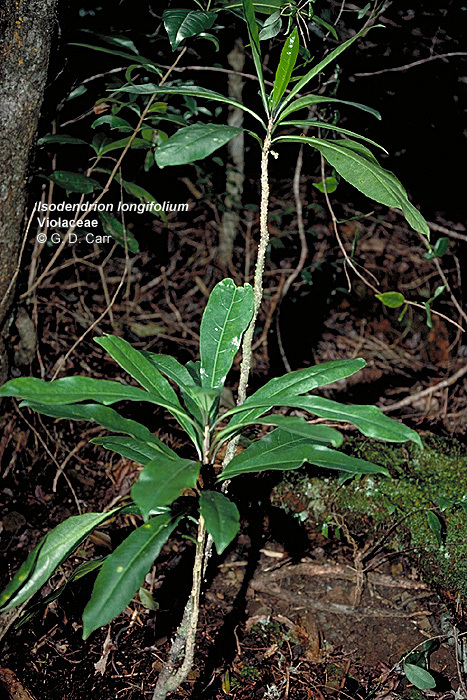 Isodendrion longifolium, aupaka. 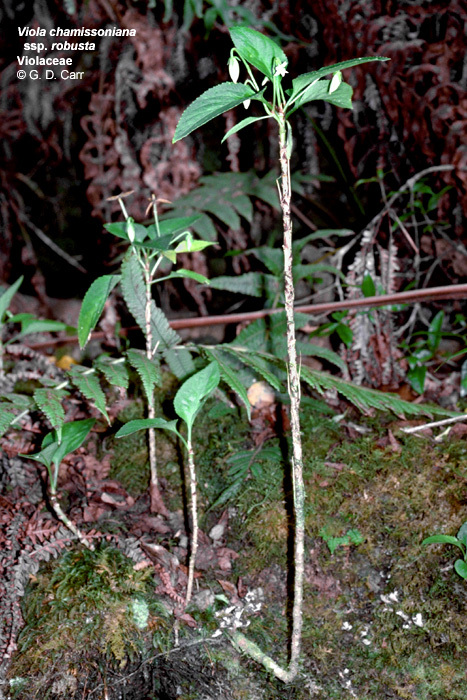 This Hawaiian endemic woody genus has a few persistent, pointed stipules can be seen on the stem (middle photo).